In working only with industrial applications , we realize that the operation of the chiller is the most important part of the industrial manufacturing process. No matter what type of industry you work in , if the chiller is not working – neither are you. You can’t afford downtime for any length of time so we strive to make our chillers more dependable, reliable, and user friendly as possible. At JC Younger Company we understand that your needs may not be the same as the rest of your field. When you work with (JCY) we’ll take the time to listen and learn what your business needs in a chiller to ensure that you get the best quality system. We custom build our units to fit your application. Anyone can sell you an “off the rack” or catalog chiller, but we want to sell you the RIGHT chiller. 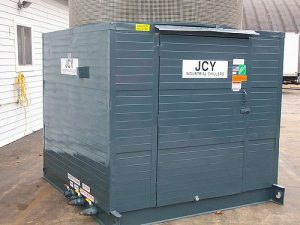 JCY Industrial Chillers are available for any type of application including rental chillers for temporary , emergency or research/development (r/d) systems. The rental units are available from single month rentals to long term r/d applications. In the event we cannot deliver a purchased chiller as quick as you may require it , we can provide a rental unit at a 50% reduction in rental rates until we can deliver the unit. JCY can help you from start to finish on your project. We will deliver the purchased unit within the original delivery time or the rental unit remains at no charge until it arrives.